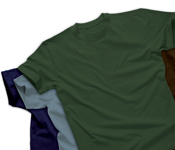 Aurum Organic currently offers a Men’s and Ladies T-shirt in 100% Certified Organic Cotton, in 10 stock colors. New styles arriving in infant, toddler, youth and adult micro thermal. We offer a custom program that allows us to manufacture any product in the fabrics we offer. We are a full service company that provides printing, packaging and various tagging options that are eco-friendly.